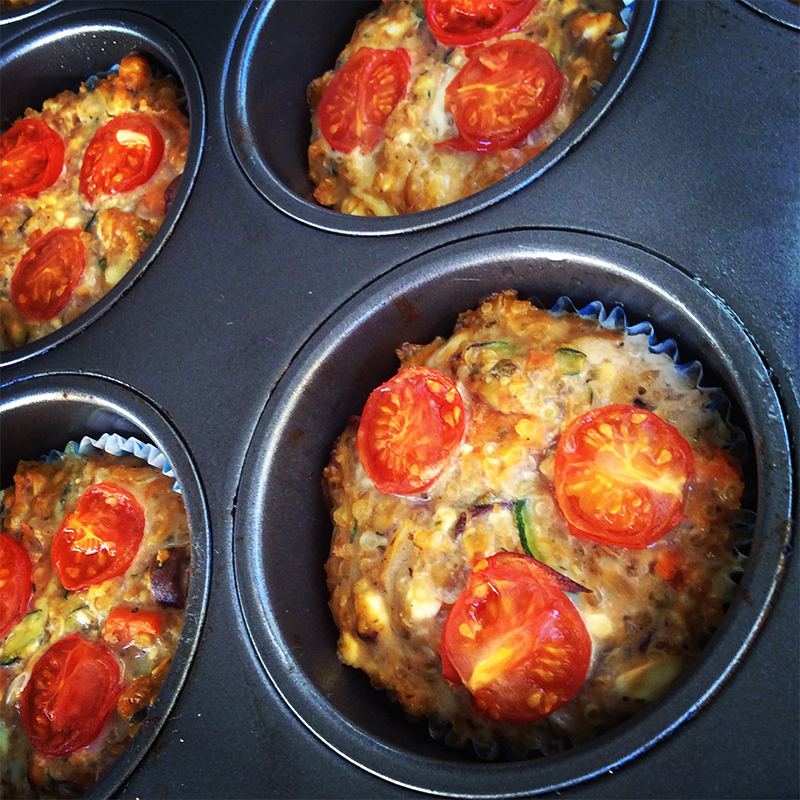 Looking for a frittata / savoury muffin that is high in protein and a good source of fibre? Try this recipe which is also vegetarian and gluten free. If you’d like meat in it, simply add some shredded cooked chicken or cooked mince. Heat a large non-stick fry pan on medium heat and add the oil. Then add the onion, garlic, salt and pepper, combine and toast until just starting to golden. Then add the carrots and zucchini and cook until cooked through. Stir occasionally. Once cooked removed from heat and allow to cool slightly. In a large bowl add the eggs, quinoa, cottage cheese, cheddar cheese, mashed chickpeas, cooked vegetables, sweet potato, olives, tomato paste, pesto, oregano and half the cherry tomatoes. Gently combine all ingredients. In a muffin tin, add the muffin papers and lightly spray with olive oil spray. Evenly pour mix into each tin and top with 3-4 cherry tomato halves leaving the cut side up. Place in the pre-heated oven and baked for 25-30 minutes. Eat hot or cold, store in the fridge. These make great breakfast, lunch and dinner meals or snacks. For a meal serve with a side of salad or vegetables.